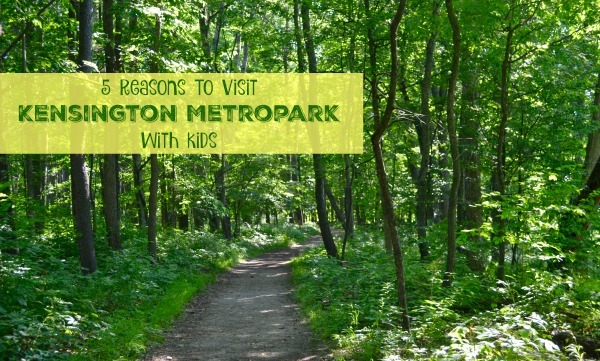 One of my favorite local gems to visit for some outdoor exploring is Kensington Metropark. I’ve been coming here since I was young and it just keeps getting better with each passing year. There is so much to do! 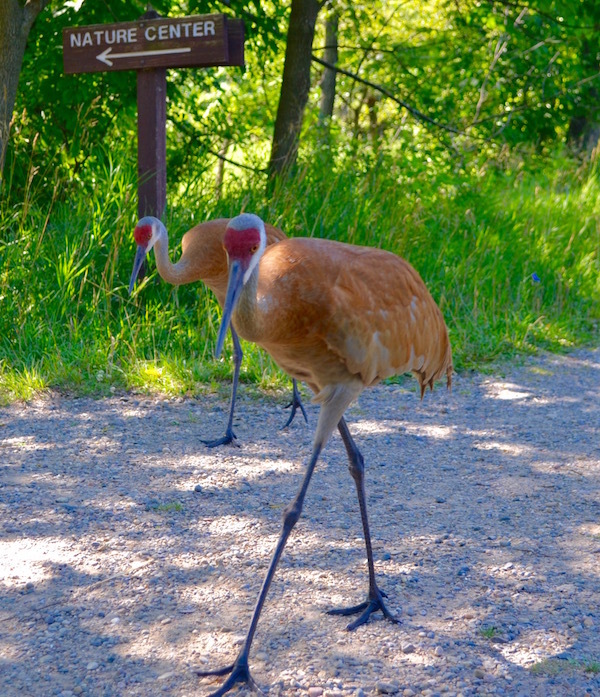 If you aren’t familiar, Kensington Metropark is part of the Huron-Clinton Metroparks system located at the intersection of Brighton, Milford and South Lyon. The park covers 4,481 acres surrounding Kent Lake. 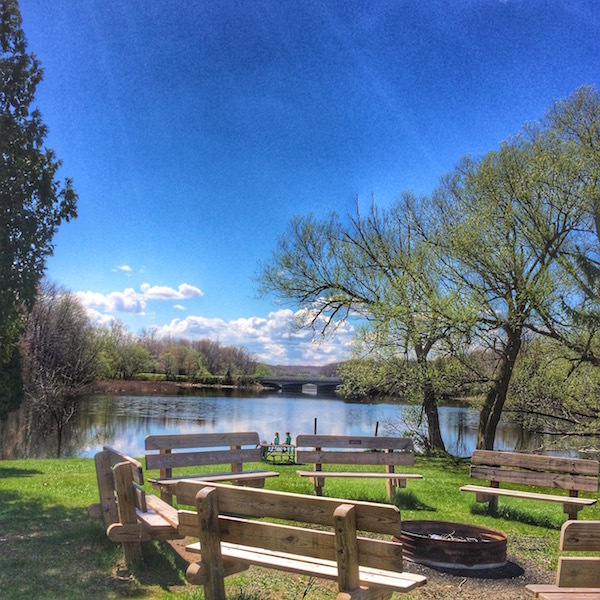 The park has an 18-hole golf course, a disc golf course, toboggan hill, a nature center, a farm center, picnic areas, beaches, and more. A 8-mile paved hike-bike trail makes it a popular spot for runners training for long runs, too. 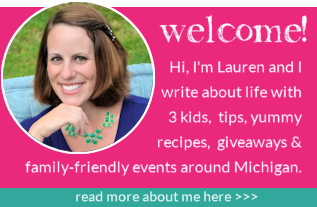 When I was younger, I loved visiting the beach, biking, rollerblading and disc golfing. Now that I have kids, my time is spent a bit differently, though I would love to get back into those things eventually. Until then, I am enjoying seeing the park from my kid’s eyes and have some reasons to visit outlined below. 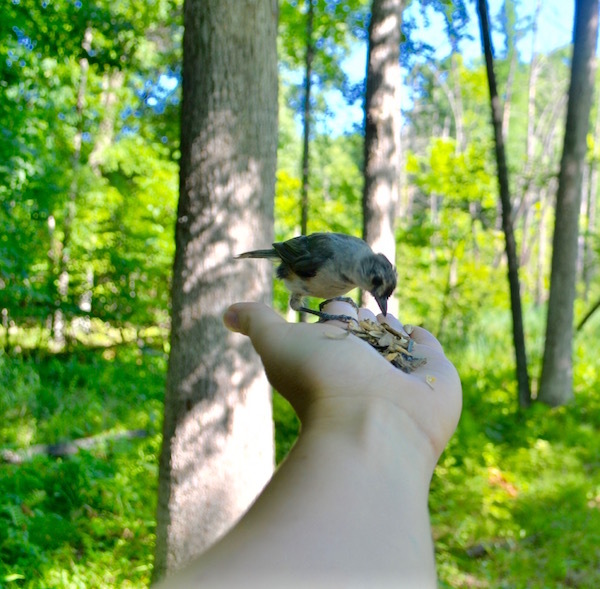 We do love to bring birdseed and feed the birds along the path though — just stand below some smaller trees with your hand held flat and be quiet, and they will come right up to you. It’s really magical! In addition to the nature trails, there is a nature center building, which houses some animals and has some fun kids activities. My kids always ask if they can take one out and they always oblige and teach them about the animal. 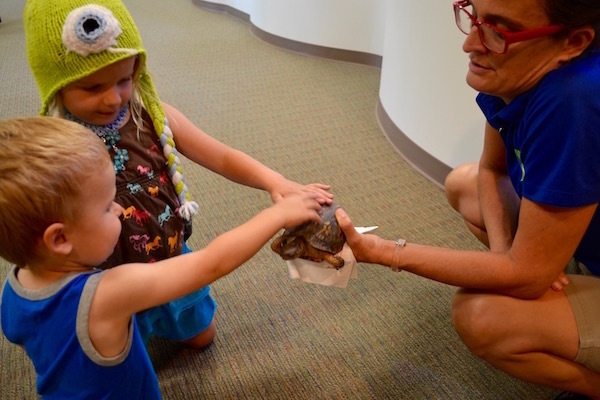 We loved meeting an Eastern Box Turtle named Flippy on a recent visit. She looks good for being 70 years old, eh? 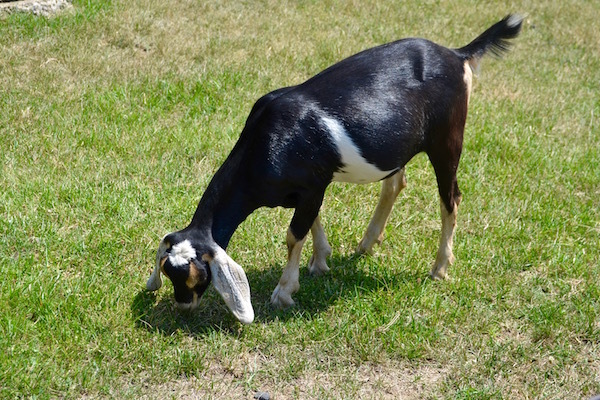 With goats, horses, pigs, chickens, lambs and more, the farm center is a fun place for little ones to explore and learn more about farm life. There is plenty of programming throughout the year, too, with events typically costing $5. 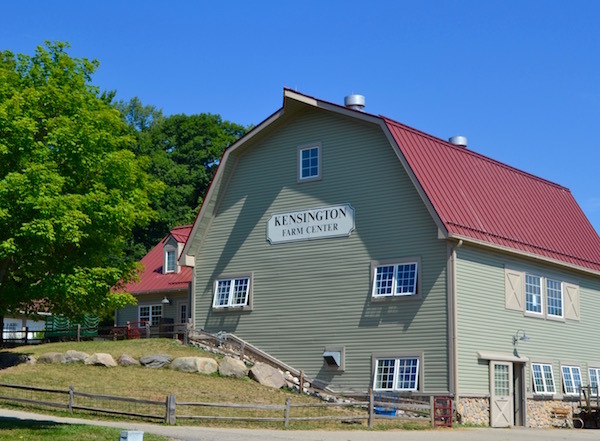 Additionally, the farm offer hayrides and sleigh rides during the weekend for an additional fee. Another summertime favorite we love is the Farmhouse Grille, which is right near the barn and serves Hudsonville ice cream for $2/kid scoop. Yum! This water playground located close to the Kent Lake Rd. exit features two 240-foot twisted water slides and a water spray ground. Waterslide riders must be 42” tall or higher. 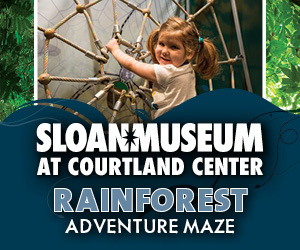 Admission is: 42” and taller – $6, under 42” – $5, children under 30” are free. Rates are reduced after 5 p.m. The splash pad is also available during off-hours for groups for $200. A great spot for a summer birthday bash! A beautiful way to see the park is by boat! 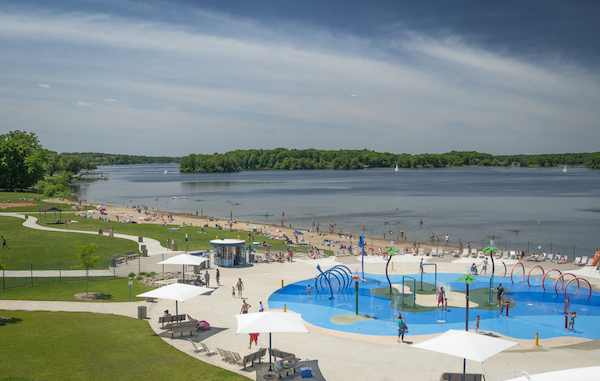 Paddleboats, canoes, kayaks, rowboats and stand-up paddle boards are available at the boat rental building near Maple Beach. Life jackets are provided and must be worn at all times. Riders must be 18 years of age and older to rent a boat. A $30 deposit and driver’s license is required for rentals. Rentals cost between $7-$17/hour. My personal favorites are the ducks and swans…and purple dragons! They are great for a family since they can hold up to 5 people. Additionally, families can enjoy a leisurely cruise on Kent Lake aboard the Island Queen II, a 25-passenger pontoon boat. 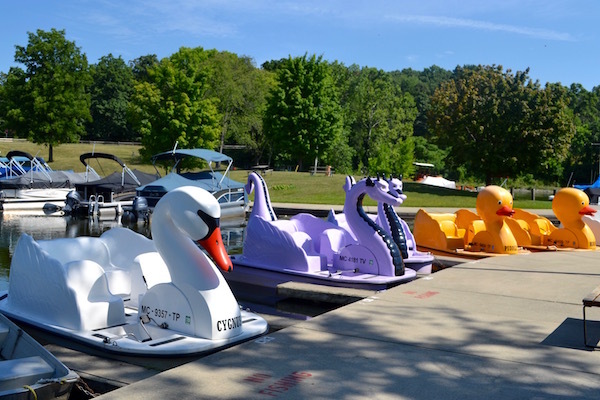 The boat departs every hour, from noon until 6 pm, daily during summer months from the Boat Rental Area. 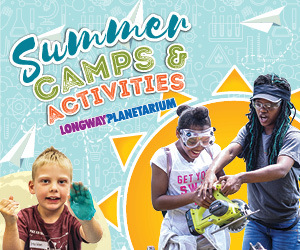 Children (ages 3-12) and seniors are $4/ person, adults: $6/person, children two years and under are free. There are many places to stop in the park to play on playground equipment or picnic. The park costs $10/day or $35/year. The annual pass grants access the other 12 metroparks for free. Learn more about Kensington Metropark online | Facebook | Twitter. 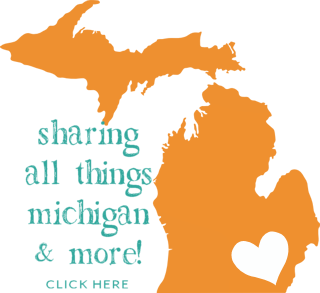 Where are your favorite parks in southeast Michigan? Too funny! All of the animals are so friendly, for better or worse! The birds are especially cool since they aren’t like that anywhere else that I’ve seen. Bring some birdseed and even the squirrels and chipmunks will be your friend 😉 Thanks for chiming in, girl! This looks like a fun park. I am looking forward to warmer weather. My kids would absolutely love the park. I’m so lucky to live close to kensington Park. There’s so much to do. I love the 8 miles of a bike path.